sleeping (with the ) fish? I was inspired by Tracerapotts's picture on Flickr (go look now – I love it). I used some of the left over felt I made using the embellisher and cut it into pieces. 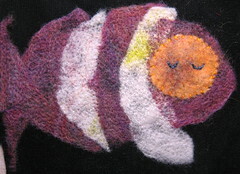 The orange face was a nest of orange dyed yarn felted aggressively, made separately and applied. I needed it after some over-aggressive felting left a giant orange and black hole where the face should be. It isn't quite done yet, but I am not sure how hard to pursue the idea that really came from someone else.